London. : Printed by J. Macock for John Martyn, Henry Herringman, Richard Marriot. 380 x 240 mm (15 x 9 inches) - x,578pp; 557pp. Cover rubbed and bumped with corner and edge wear. Abrasions on lower board. Minor joint cracking at spine head. Rebound. Several mispaginations. Lacks portrait page. Title page repaired. Damp staining to lower half of first 20 pages and lower corners fragile with tears from lower edge. Some scattered staining throughout. Two heraldic bookplates on paste-down of R. Halford and Edmundus Parker. Contents tight. 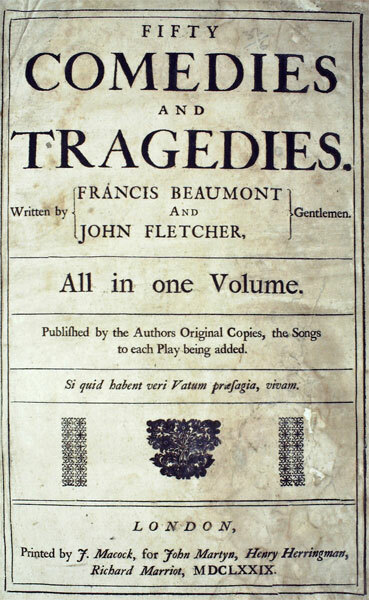 Francis Beaumont [1584-1616] was a dramatist and collaborated with John Fletcher. John Fletcher [1579-1635] also collaborated with Shakespeare. The first folio of plays published in 1647 had 35 plays. This 1679 edition has another 18 added making a total of 53.